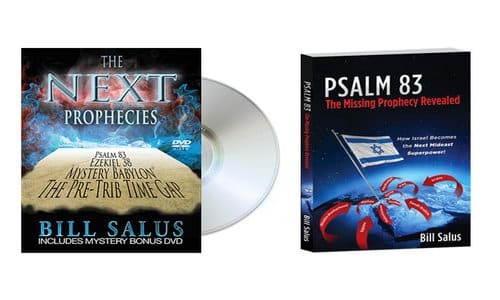 Order The NEXT Prophecies DVD for $15.95 and get a FREE copy of Bill Salus book entitled, Psalm 83: The Missing Prophecy Revealed, How Israel Becomes the Next Mideast Superpower. Psalm 83 predicts a climactic, concluding Arab-Israeli war that has eluded many of today's top Bible scholars, and yet, the Middle East stage appears to be set for the fulfillment of this prophecy. While many of today's top Bible experts are predicting that Russia, Iran, Turkey, Libya, and several other countries are going to invade Israel according to the prophecy in Ezekiel 38, this timely book explains how Psalm 83 occurs prior. Discover how Israel defeats their ancient Arab enemies, and why Americans need to stand beside Israel in this coming war! This book put the Psalm 83 subject on the prophetic map and has been featured on CBN, Daystar, Prophecy Watchers and most every Christian TV show. It’s the book that motivated, Gary Stearman, Hal Lindsey, Chuck Missler, Dr. David Reagan, Jan Markell, LA Marzulli and many other top Bible prophecy experts to rethink their end times models.